I had a new art experience recently. 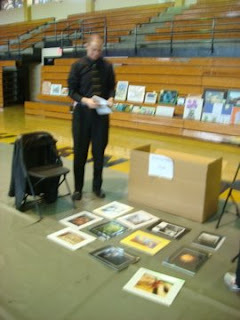 I was asked by Jill Schneider of Greenville, SC to recruit judges for a statewide student art competition. It was the state level of the national PTA Reflections program for students (Early Elementary (grades 1-3), Elementary (grades 4-5), Middle and High school) throughout South Carolina at Lower Richland High School in Columbia on Saturday, February 7, 2009. The theme this year is WOW! 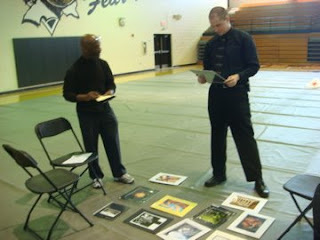 and there were two categories to be judged…visual arts and photography. 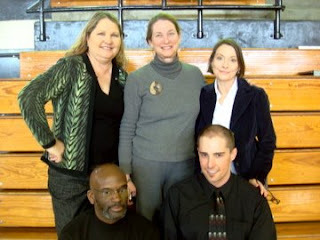 My goal was to recruit judges which represented the diversity of South Carolina (gender, ethnicity, counties) and of art (mediums, education and experiences). I was grateful to the following artists who graciously gave of their time, energy and expertise. Back row: Doni Jordan(l), Ellen Kochansky (m) and Liisa Salosaari Jasinski (r). and photograher Nick Cortin (r) discuss each entry. (click to enlarge) Photographer Nick Cortin carefully studies an entry. 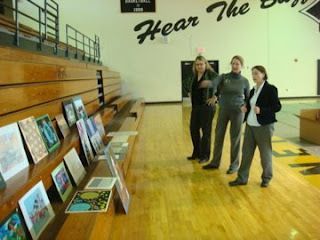 artist Doni Jordan (back) discuss the visual art entries. We were all amazed at the entries and found it difficult to narrow it down to the winners (three winners and three honorable mention in each age group). Winners will be announced at the awards ceremony in Greenville on April 25, 2009 and will advance to the national competition.